Last week, Tunisians experienced hard times. Bad news succeeded one another. Mrs Saida Agrbi , a woman known for being corrupted and known for her loyalty to Ben Ali and his wife as you can see in this debate I had with her in late December escaped the country. Two ministers known for their crimes against Tunisian people under the Ben Ali's regime were released. They were jailed earlier this year after the ousting of Ben Ali. Tunisians reacted to all these sad developments. 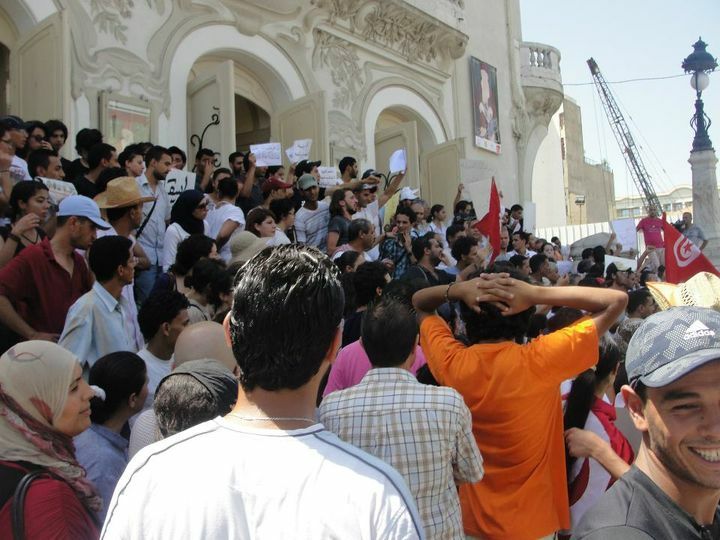 A small sit in was organized outside the First Instance court of Tunis. Some lawyers have successively given speeches about the current situation of the country and the necessity of carrying the revolution on. Today a demonstration was organized in the capital and people walked from outside the General Union of Tunisian Workers building to the Main Avenue of Tunis and stood outside the Theatre shouting freedom slogans . Tunisians are reacting to the dishonesty of the temporary government and this is a healthy sign. Tunisians are aware that their revolution has just started and that they have to fight agin and again in order to establish the Tunisia of our dreams. Belhassen Trabelsi doit être Jugé en Tunisie. Sebsi le Peuple is watching You ! La Rue Nous Appartient ! La Tunisie aussi ! !